Cut the bananas along one side and make sure you don’t cut all the way through. Break chocolate into small pieces (you don’t have to do it if you are using chocolate buttons). Stuff the bananas with chocolate pieces. Let the bananas rest for 5 minutes before serving (they are extremely hot). With Valentine day approaching fast I was thinking what would be the easiest homemade dessert recipe to make. Not everyone wants to bake or create complicated desserts and not everyone has the time for it. But preparing something homemade rather than buying it in the shop is a nice gesture and I personally appreciate the effort and care that was put into it. One of my favourite quick desserts when I was a student, were roasted bananas. We favoured this particular recipe with my housemates at our student dinner parties. 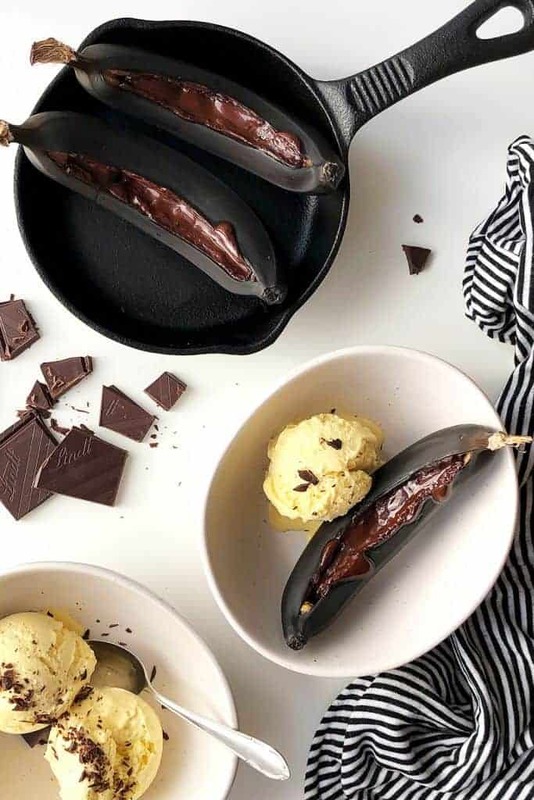 It’s super easy and cheap and it catches people attention when you serve them black baked bananas with melted chocolate. I thought that if the baked bananas were popular among my student friends why not to try it with my kids. My elder son loved them, he even ate 2 whole bananas! But they didn’t impress the younger one. I wonder if it was the dark chocolate taste, the warm, mushy banana texture or the black colour he didn’t like (my son can be sometimes fussy for very silly reasons). Next time I will make one banana filled with milk chocolate buttons for him and see how that goes. This is a hassle-free dessert I can recommend for any dinner party, kids birthdays or just a simple afternoon treat for big and little ones alike. Accompany the baked bananas with vanilla ice cream or whipped cream and this dessert won’t stay in the bowls for very long. 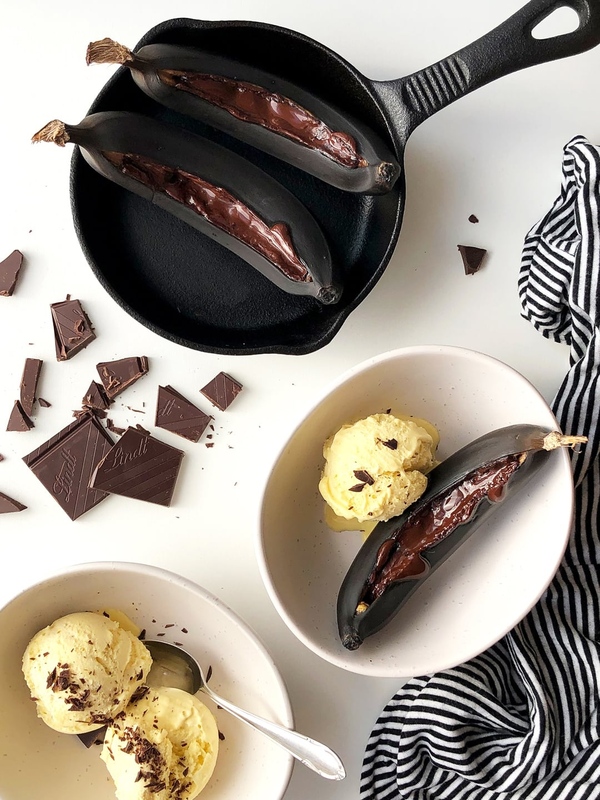 You can either bake bananas with the skin on or you can peel them and baked them in a foil or on the skillet in the oven. They can be grilled on the barbeque too. 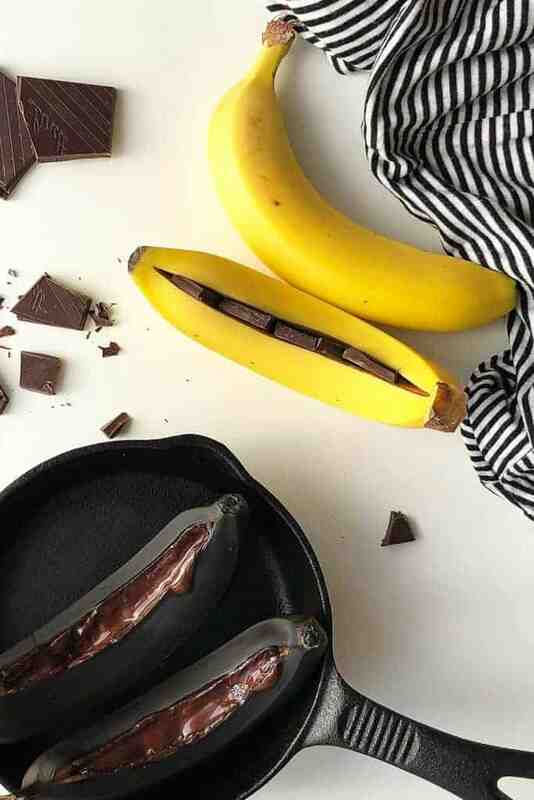 I don’t peel them when I am making my chocolate baked bananas as it is easier to stuff them with chocolate. 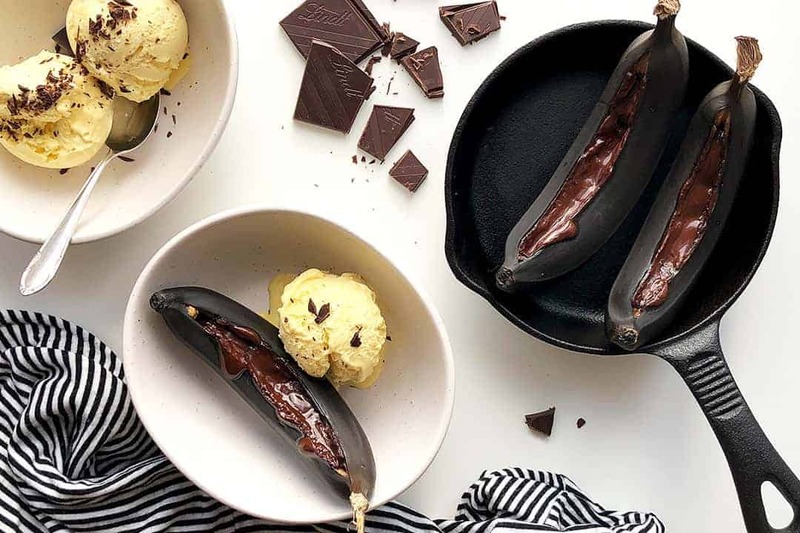 Strangely enough, I think serving completely black bananas (the skin gets pitch black in the oven) is somewhat eye-catching. How long to bake bananas for? The oven time for baking bananas is somewhere between 10 and 20 minutes on 180° C. It all depends on a few factors – their size, if they are with skin or without, how ripe they are and how mushy you want them. I baked my small sized bananas with the skin on and it took just under 15 minutes for them to be done. If you leave the skin on you know the bananas are done once the skin gets black all the way around. What to fill the bananas with? Simply fill the bananas with any type of chocolate. My favourite is 70% dark chocolate. I prefer buying the Lindt brand here in the UK because their chocolate block is thinner which makes stuffing bananas easier. Chocolate buttons are great too especially because they are thin. 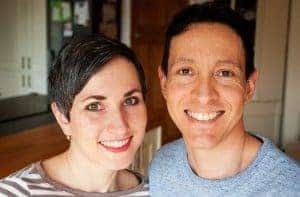 Alternatively, you can experiment with all sorts of ingredients that go nicely with bananas like honey and cinnamon, maple syrup, rum, brown sugar, peanut butter and nuts (walnuts or hazelnuts) or even marshmallows. Use only ripe bananas for this recipe. If the bananas are not ripe they won’t taste very good after you bake them. I used slightly under-ripe bananas once and it completely ruined the taste of the dessert. This rich chocolate brownie sponge is very nice on its own and tastes delicious with coffee or a glass of milk. But for special occasions why not to turn it into a celebration cake with a lovely chocolate cream filling. Would you like to make an impressive chocolate tray bake that’s perfect for any party? Try my exceptionally good tray bake sponge with curd cheese filling and feathered icing effect.